If you are looking for a new addicting and challenging game, we have found one, so look no further! Crazy Color Switch is quite a new game on the App Store and it is designed for both iPhone and iPad. It is the perfect time killer, suitable for anyone who loves a good fun and entertainment. Maybe you are familiar with the popular switching color game. Well the developers made a similar gameplay, but added lots of twists and made it more challenging. The goal of the game is simple – just tap on the ball very carefully (not to slow and not too fast) in order to pass through the colored circles. You can pass through them only on the circles’ points that are colored same as your ball. While doing that, you can also collect the stars to get higher scores. This game is not an easy task, meaning it is much faster and of course more entertaining. 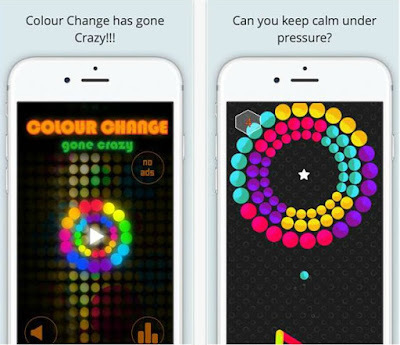 With straightforward gameplay and amazingly created graphics, Crazy Color Switch will challenge you in a way you never thought is possible. The game is available for download on the App Store. There is a free version and an in-app purchase to remove all of the ads.